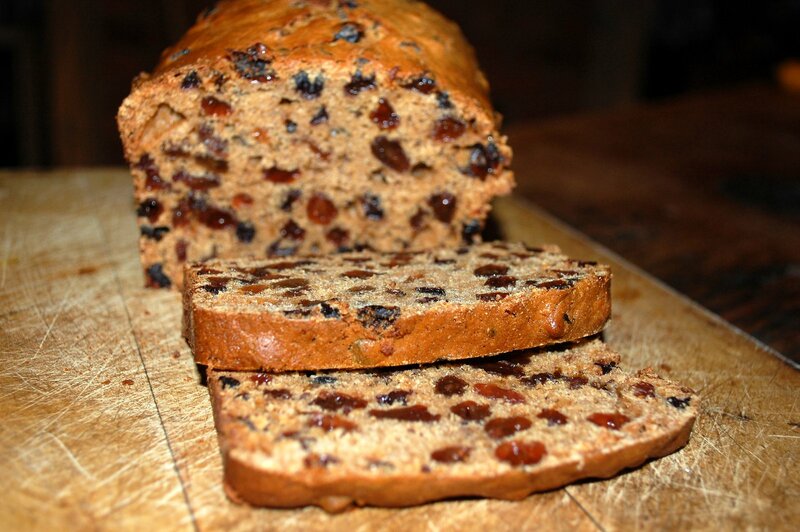 For whatever reasons, I have not been quite happy with the original teabread recipe that I created and posted a few weeks back, so I have been playing around with the recipe now and baking away. Now several teabreads and a family of very happy tasters later, I think I have cracked it. The key is still in the tea - the better the tea, the more interesting the tea, the better and more interesting the end result. I have now made it with breakfast tea, Assam tea, Christmas chai tea and Redbush Chai tea and they all come out with slightly different flavours, but they are all great. The tea should always be made with loose leaf tea as you lose that fustiness from the tea bag, plus why use good ingredients then spoil their subtleties with the imperfection of the flavour from a bag. The other addition that I have made is I have substituted buttermilk for the butter, which adds a different richness to the cake that was not completely right beforehand, however you can either substitute this for a full fat milk or omit this ingredient but then add extra tea to compensate, otherwise the teabread loses some of its moistness, which is part of the joy and vital to the texture. The other part that I have played with is to work on variations of the steeping of the fruits. Firstly, I think it is better to boil the fruit for 10 - 15 minutes, then to leave the fruit to cool and steep in the brewed tea ideally overnight, but certainly until the fruit has cooled to a warm to the touch temperature. The alternative of steeping in freshly brewed tea did not seem as successful, although fine; perhaps the initial boiling softens up and gets the fruit more receptive to taking up the flavours of the tea. Finally, I have upped the quantities, the better to fit my loaf tin. The end result is moist, rich and moreish, tasting great with butter. Preheat the oven to 180C/ 350F. Line a loaf tin with baking paper. Place the dried fruit and muscovado sugar into a heavy bottomed saucepan, then add the strong tea, heat and simmer for 10 – 15 minutes until the fruit has plumped up. Leave to cool in the pan, ideally overnight. Sieve together the plain flour, baking powder, Fairtrade cinnamon and nutmeg powders. Make a well in the centre of the flour, then add in the egg and stir thoroughly with a spatula. Add the buttermilk and stir until you have a soft dough. Add the fruits and throughly beat together with the silicone spatula. 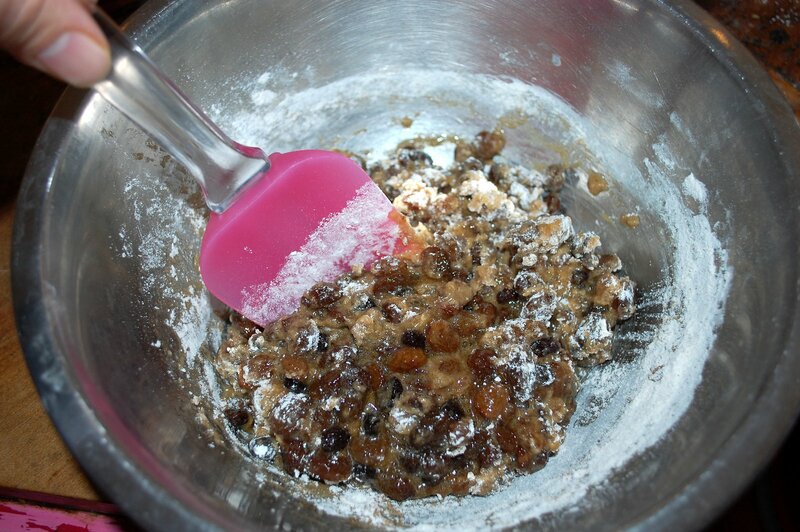 Pour the fruit teabread mixture into the prepared loaf tin. Bake for 1 hour 10 minutes, remove from the oven then leave to stand in the tin for about 10 minutes, before turning out and leaving to cool on wire rack. Start checking the consistency of the teabread towards the end - when it is springy to a light touch on the surface of the teabread, it is done. You do not need to leave this to cool down completely as it is lovely eaten warm.